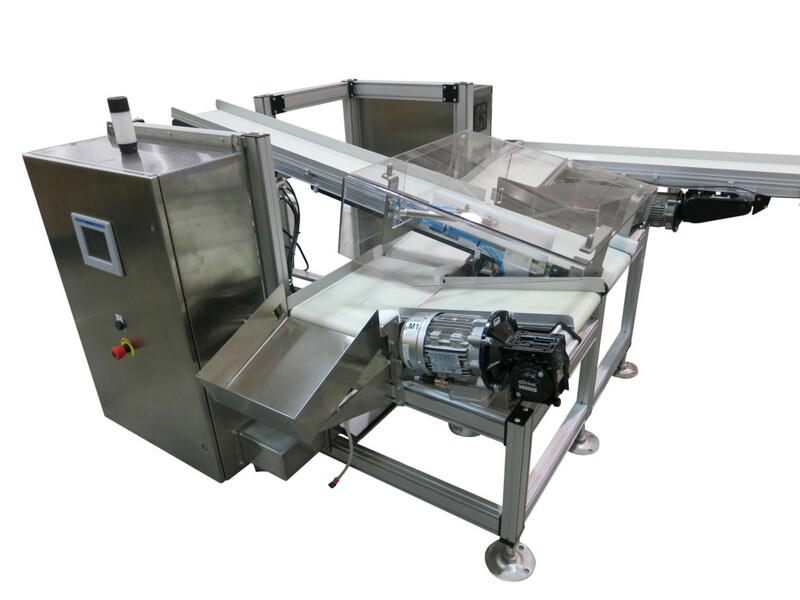 This conveyor system is designed to move medical products for a cleanroom environment. A cleanroom is used when the manufacturing needs a low level of environmental pollutants. The machine leading up to this system is a vacuum sealer. The product enters onto the conveyor (A) from the sealer and down to the next conveyor (B) where it must pass a quality test. If the part fails the test, the conveyor reverses direction and the part is dropped into one of the custom-designed, stainless steel chutes (C). If the part passes the test it continues along on the conveyors to be returned to the vacuum sealer to be sealed in a second bag. After leaving the sealer a second time, the part must pass one more quality inspection. If the part fails this time, a pneumatic divert gate pushes the rejected part down another chute. If the part passes here, it continues up the conveyor and out of this system. All conveyors used here are 2200 Series industrial flat belt conveyors. The system also includes a Human Machine Interface screen on a low voltage enclosure for fault reset, minor program adjustments, and maintenance.